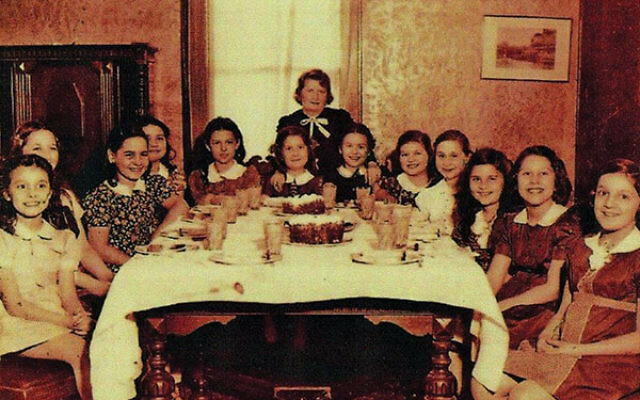 Lois Lessner Reiss picked up an 80-year-old photograph of 12 seven- and eight-year-old girls, plus one adult, and reeled off each of the names without hesitation. Others in their late 80s may have memory lapses, but not Lessner Reiss nor her four colleagues who gathered for lunch on Dec. 7 at the Bistro restaurant in the Lester Senior Housing Community in Whippany, where one of them resides. The five women, all of whom were among the 12 young girls in the photo, have known each other since they were second- and third-graders at the Hillside Avenue School in their hometown of Hillside. Standing behind them in the photo was Pauline Levin, who organized an after-school charitable club for the girls that met every Friday. The club lasted until they graduated from high school, but that wasn’t the end of the relationship; the members continued to get together during college breaks, and on a monthly basis since graduating. Their friendship has endured for more than three quarters of a century. Seven of the 12 members are still living, but one who lives in Colorado and another in Florida didn’t make the trip to Whippany. Pauline Levin had been active in supporting the Cardiac Home in Caldwell, which gave medical help to children whose hearts had been weakened by rheumatic fever in the years before antibiotics were available. She insisted that each of the group’s members pay dues each week — five cents — to support the home. They started by calling themselves the Cheerful Subjuniors, changed their name to the Pauline Levin Memorial Group to honor their late mentor, and then again to the Tamar Charity League. “It was a very nice idea because children love to be helpful and love to help others,” said Bette Hammer London, who maintains the group’s website at tamarclub.org and still lives in Short Hills. “We all loved to go to Bette’s house,” said Reiss, who lives in West Orange. After graduating from college and getting married, Janis Weinberg Shafarman moved to Washington, DC, and was absent for meetings for nine years. But Pauline Levin phoned Shafarman’s mother and asked, “Where’s Janis? We want her back,” said Levin Cohn, who lives in Hackensack. “So when I moved back to Jersey I was happily reconnected with my friends,” Shafarman said. She now resides in Springfield. Another strong bond was their Judaism. During the years of World War II some of them faced anti-Semitic moments in their hometown. Noting that they, “children of the war,” were meeting on the 75th anniversary of the Japanese bombing of Pearl Harbor, each of them could remember the moment when they learned their country had been attacked. “I was sitting in the living room and my parents were listening to the radio. I started talking and my father hit me on the rear end because I was making noise while they were listening to this terrible news,” said Thieberger. “A sad time was when I was 10 years old and our family moved out of Hillside,” said Bette. Despite her relocation to the Weequahic section of Newark, she took a long bus trip from Newark to Hillside to attend meetings. The friends agreed the best of times was the end of World War II. “It was very joyous,” said Reiss. “We had lovely lives,” said Thieberger. “We were so innocent,” said Shafarman. After graduation “We remained firmly attached,” Reiss said. “We would meet all the time. Through thick and thin, if there was a happy occasion or a sad occasion we always stuck by each other. We were very, very loyal and kind, and we still are.” Beginning with birthday parties and bat mitzvas, they attended one another’s weddings and now, sadly, funerals. In later years, the women made it a point to meet once a month. They keep their meetings lively with conversations about books, politics, theater, and their families. Together, the five have a total of nine grandchildren and 10 great-grandchildren. “A number of us were at home with young children and then went to teach school,” said Hammer. “It was an acceptable career path for women,” said Thieberger. They spoke of the enormous developments in technology they have known in their lifetimes, from party line telephones and bulky AM radios to cell phones and the Internet. Hammer said she has found “the computer is a wonderful thing,” but Shafarman disagrees. “I see a downside,” she said. “Kids don’t play in the street and they don’t communicate with each other, and I think it’s a shame,” though she admitted that she plays Scrabble online. What have they gained from these many years of friendship? “I have had a much fuller life,” said Thieberger. “The group added to my life because I tend to be a loner,” said Hammer. And when asked why their group has endured for 80 years, Hammer had an instant answer: “It’s because we all love each other,” she said.